Over the years, I have created several Christmas decorations either as gifts or to use in my own home. This weekend as I was beginning to decorate our house, I was remembering the different years when I created the decorations. Since these are decorations I made in previous years, there are no step-by-step tutorials to go with them. But, all three of them are easy enough that you can put them together easily. 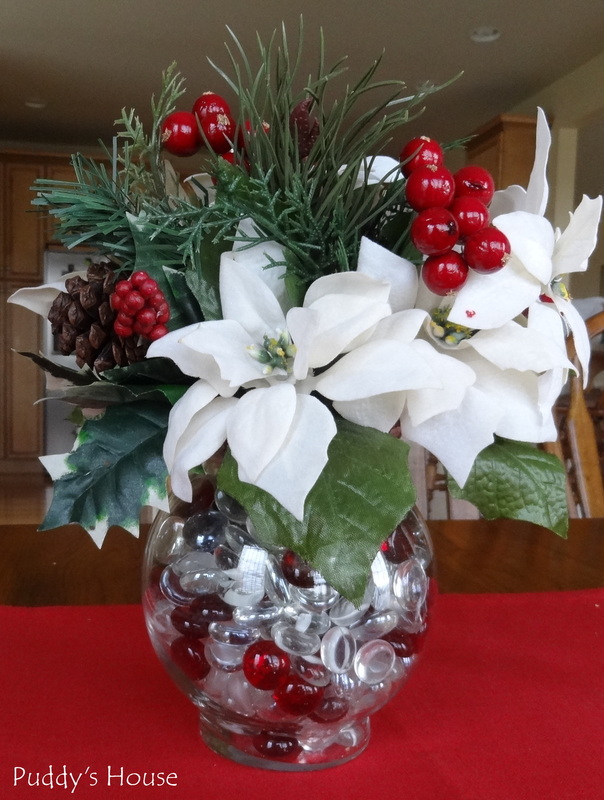 I use two of these centerpieces in my Christmas decorations on our dining room table. The year I made them, I made one for each of the females in my family. All of the supplies are from Michael’s or AC Moore. You just need a glass vase, some floral foam, vase filler (the stones in my vase), and then floral bushes or picks. I cut the floral foam and put it in the vase, and then filled around it with the stones. Then, I cut the floral bushes apart with wire cutters and just stuffed into the foam until I had the complete look I wanted. 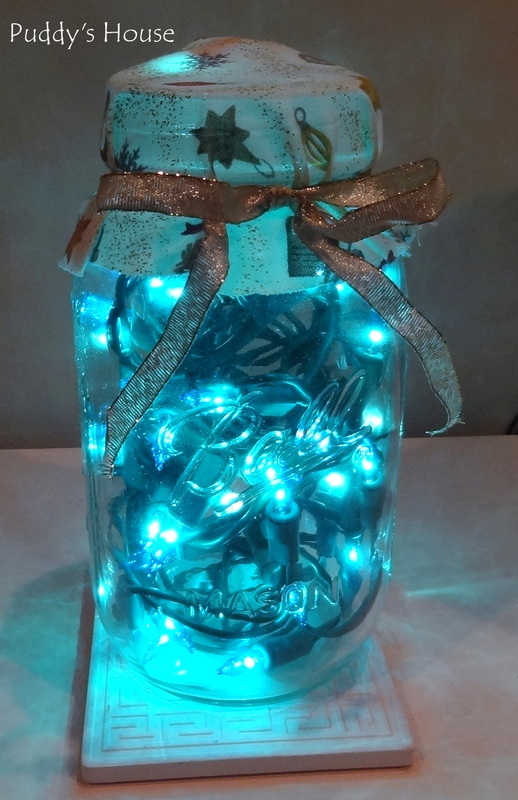 The lights in canning jars is probably the easiest of all. I just used the small strings of lights. Mine are old strings before the days of LED lights, so they did get a bit warm, which is the reason I keep them sitting on coasters. All you do is stuff the lights into the jar with no order, so it looks random. Then, I cut circles of Christmas fabric, several inches wider than the jar. 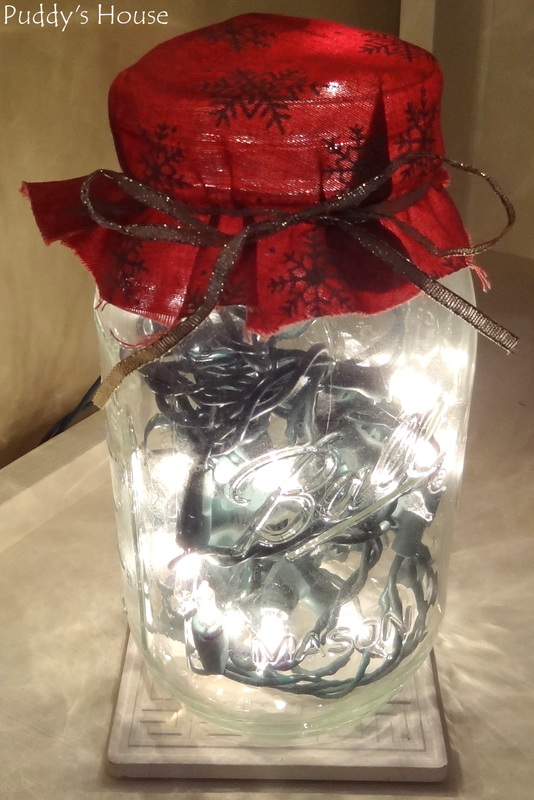 I put the fabric on top of the jar and just wrapped a wire ribbon around and tied it with a bow to hold it in place. 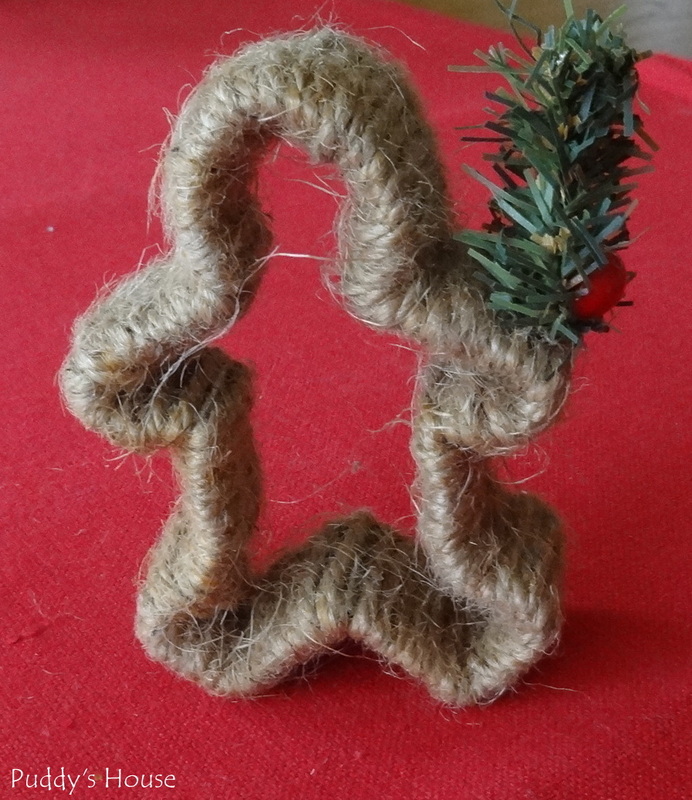 The last decoration is a gingerbread cookie cutter wrapped in jute twine. The beginning and end is secured with hot glue. Then, I attached a bit of fake greenery and berry with the hot glue as well. If you wanted to use it as a tree ornament, you could just attach a loop of twine with hot glue to the top. I just sit the gingerbread man on one of my shelves add a little extra texture to my decorating. I always enjoy displaying the items that I have made, and these are simple enough that you can make a few extra for gifts. I’ve also made several different ornaments over the years, so I will share those next. Anyone else like creating your own Christmas decorations? Do you cut a hole in the mason jar for the plug? If so, what do you use to cut the hole? Thank you for your reply! I didn’t cut a hole for the plug. It just comes out the top and is covered by the fabric with ribbon securing it.